The battle of the Standing Rock Sioux to put an end to the Dakota Access Pipeline (DAPL) running through their lands and under a lake sacred to their people has been a long one and mostly without fruit. However, they recently got their first real victory–sort of. The judge handling the case has officially ruled that the environmental survey done before starting the pipeline was insufficient. This is the first step necessary to shut down the pipeline completely. However, as substantial as this victory is, the ruling does not go as far as the Standing Rock Sioux would likely have hoped for. Let’s take a look at the ruling, and what it does and doesn’t do, to see why the judge ruled that the environmental survey was insufficient and why the victory is not all the Tribe hoped. The Standing Rock Sioux have previously lost cases attempting to stop the DAPL on grounds that the DAPL destroyed sites sacred to them (this one was lost after the site in question was bulldozed over the weekend after the suit was filed) and that they were not consulted on the pipeline as required under a treaty between them and the U.S. Government. This time, however, the Sioux were targeting the insufficiency of the study made on the environmental impact of the pipeline. They argued that the study, the one expedited via an executive order from President Trump on the fifth day of his presidency, didn’t meet the requirements of the National Environmental Policy Act of 1970 (NEPA). This time, the judge in their case finally agreed with them. NEPA requires agencies to put together an Environmental Impact Statement for major proposed federal actions along with either a Finding of No Significant Impact (FONSI) or a statement saying how they will mitigate negative impact on the environment called- lo and behold- a Mitigated FONSI. In order for these reports to meet the requirements of NEPA, the agency must have: “(1) accurately identified the relevant environmental concern, (2) taken a hard look at the problem in preparing its [FONSI or Environmental Assessment], (3) the ability to make a convincing case for its finding of no significant impact, and (4) shown that even if there is an impact of true significance, an EIS is unnecessary because changes or safeguards in the project sufficiently reduce the impact to a minimum. Out of these, the vaguely described “hard look” requirement is the one that made the difference. In order to have taken a hard look, an agency needs to look both the probability and the consequences of any given harm to the environment that has more than an extremely remote chance of happening. In his whopping 91-page decision Judge James Boasberg highlighted two main reasons why the environmental study didn’t take the hard look required by NEPA. First, the U.S. Army Corp of Engineers did not consider how controversial the impact of the DAPL on the environment would be. Second, they did not look at the impact of the pipeline on the Sioux’s ability to hunt and fish on the land. Controversial, in the context of NEPA, doesn’t mean quite what you’d imagine it to. Instead of implying that agencies should consider whether the public might consider the impact on the environment controversial, the requirement instead focuses on controversy as to the scientific method of the study–whether the means by which the study itself was done may be controversial. This was the case for the Corps’ study. Specifically, the study’s methodology was criticized for making a very general analysis of potential environmental impacts–often relying on studies which were either too general or outright erroneous when applied to the DAPL. By failing to consider whether their methods were improper, the study failed to meet the hard look requirements of the NEPA. As to the ability to hunt and fish, the Corps’ study looked at the potential impact on the water around the DAPL but neglected to consider potential harm to animal and aquatic life. Even if the chances were remote, the Corps needed to at least consider the impact. By failing to do so they once again fell short of the hard look requirement. So we can see that the Sioux have got their win. The environmental study is officially insufficient under the NEPA. So why would they not be celebrating? The answer is that Judge Boasberg decided not to actually put a stop to the DAPL just yet. Where the NEPA is violated the usual remedy is to put a halt to the project in violation until the agency brings itself into compliance by completing its study. This would normally mean that Judge Boasberg would withdraw the DAPL’s permits and easement and put a stop to its functions until a more thorough study was completed. 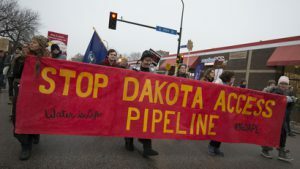 However, citing the expense of stopping the pipeline, the judge instead has allowed for hearings on a potential remedy. After a hearing last week on June 21st, it’s looking like any potential action won’t be in the cards until at least August 28th when the final briefs are due. This means no injunction for months, which in turn means that the enormous DAPL will continue shipping upwards of 520,000 barrels of crude oil a day across the land of the Standing Rock Sioux. A far from ideal situation for the Tribe. What’s more given the tone of the order (mentioning that Judge Boasberg had previously shot down the Tribe’s last two lawsuits) and the judge’s hesitance to put an actual injunction in place the Standing Rock Sioux have to be cautiously optimistic at best. The order is a win, but it’s far from a true victory. DAPL: Can Trump Push Forward the Dakota Access Pipeline? DAPL: Protest Camp Burned to the Ground, What’s Next?